Here is a recipe for something sweet and delicious and satisfying that doesn’t have any refined sugar, gluten or dairy. H&H call it Fridge Fudge but I think it tastes more like halva, but less sweet. Anyway, it has some good fiber, lots of minerals from the sesame seeds and good fats from the tahini and the coconut oil. It’s a really simple procedure and there’s one important thing to remember: it needs to stay cooled. As soon as you leave it on the table for longer than say twenty minutes, it starts getting too soft and it loses it’s bite. Still great taste though. You will need a simple food processor. Now you don’t need a big and expensive one; for this recipe I use the one that came with my stick blender. If you don’t have one of these, I think it worth considering. I use it almost every day: to blend soups and sauces, make energy balls and chop onions and garlic very finely. During the cold and dark winter months I have been enjoying a warming and nourishing drink: my healthy hot chocolate! And I’m happy to share my recipe. The inspiration came around at a time where I decided to stop drinking caffeinated coffee because I wasn’t sleeping well. At the same time I was looking for a mid morning snack with a good amount of protein to keep me going without an energy dip. The idea was it would prevent a snack attack later in the day. So this is what I came up with. I make my healthy hot chocolate with my homemade cashew nut milk, raw cacao, collagen powder, maca powder, a pinch of sea salt and a bit of maple syrup. In case you didn’t know yet, raw cacao powder is so much nicer that the regular stuff. It has a delicate chocolate taste. It is much less processed than cocoa powder or chocolate bars. Cacao is thought to be the highest source of antioxidants and of magnesium of all foods. Collagen powder has many health benefits. It improves the health of your skin and hair, reduces joint pain and degeneration. And since it heals and seals the protective lining of your gut as well it helps to heal leaky gut. One of the benefits of maca root is that it increases fertility in both men and women. It’s a hormone balancer,and a booster for the immune system. Maca is considered an adaptogen, which means that it helps the body naturally adapt to stressors like a busy schedule, demanding job, or illness, for example. I notice that when I consume maca it gives me energy, like coffee would do, but without the crash afterwards. It makes me feel more grounded and alive. It helps me with restoring my hormone balance and it elevates endorphins, the feel good hormone. On top of that maca is its relatively high in protein, fiber, calcium and magnesium! Pour the nut milk in your mug and then add water to top up. Pour this milk and water in a saucepan and add the powders and the salt. Heat it up, using a whisk to stir. Add the maple syrup and pour into your favourite mug when hot. Retreat into a quit place where no-one can find you and enjoy! Going gluten free meant we had to re-think our snacks. My husband Hugo works as a handyman and gets hungry very easily. If he doesn’t have a good snack on him he will grab something that doesn’t work for him and suffer later. These bars are free from gluten, dairy and refined sugar and easy to make. We love them and usually make a double batch because they tend to disappear quickly. We make them with bananas, but they work with steamed or roasted squash or sweet potato as well. Enjoy as a nutritious snack! I’ve always loved making kefir and yoghurt with cow’s milk and really missed it when I decided to go dairy free. I missed the taste as well as the tons of beneficial bacteria that help my gut flora. No idea what kefir is? Have a look here. 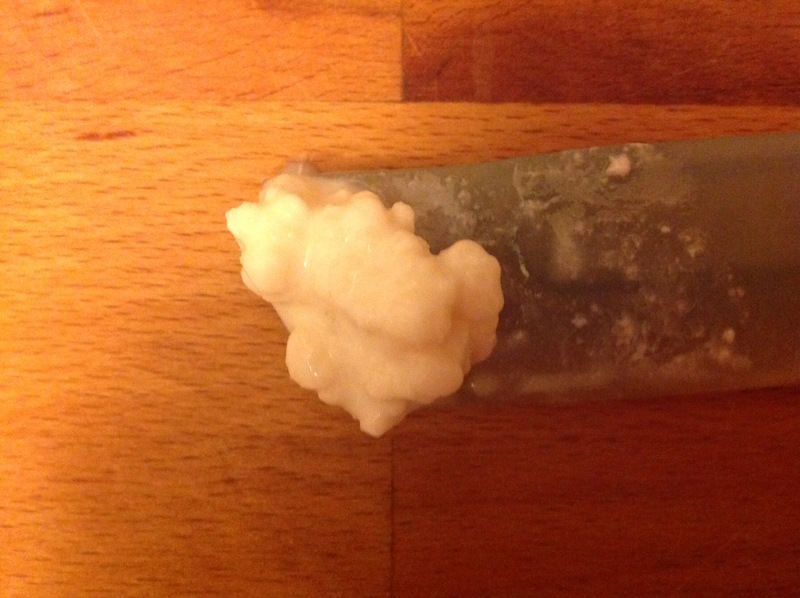 So I started making kefir from plant based milks and I much say it was a bit of a messy experiment. I tried different kinds of coconut, using canned coconut milk until I discovered it had BPA (a hormone disrupting chemical in plastic) in the lining of the can. I then tried creamed coconut, that comes in a block, that you dissolve in hot water. The problem for me with making kefir from coconut is that there’s quite a lot of (good) fat that’s solid at room temperature and that makes it hard to strain out the kefir grains once the kefir is ready. But now I’ve found an easy way to make nut milk kefir with cashews! I soak 1 cup of raw cashews in water for about four hours, together with two dates. These don’t have to be expensive medjool dates, any organic dates will do. I then rinse them and add three cups of filtered water to the soaked nuts and dates and whizz them up in my nutribullet for about two minutes. That’s all: my cashew nut milk is ready. Next step: I put a heaped teaspoon of kefir grains in a jam jar and add the nut milk and leave it on my kitchen counter for 24 hours. I store the rest of the nut milk in the fridge for later use. It keeps for about three days. It’s then easy to strain our the kefir grains through a plastic sieve, pop the grains into a clean jar and add the nut milk I kept in the fridge. I like it for breakfast with a grated apple, some nuts, ground linseed and cacao nibs.